The Great Ziegfeld adalah sebuah film drama musikal Amerika 1936 yang disutradarai oleh Robert Z. Leonard dan diproduksi oleh Hunt Stromberg. Film tersebut dibintangi oleh William Powell sebagai impresario teatrikal Florenz "Flo" Ziegfeld, Jr., Luise Rainer sebagai Anna Held, dan Myrna Loy sebagai Billie Burke. ^ Hanson, Patricia King, ed. (1993). The American Film Institute Catalog of Motion Pictures Produced in the United States: Feature Films, 1931-1940. Berkeley and Los Angeles: University of California Press. hlm. 835. ISBN 0-520-07908-6. 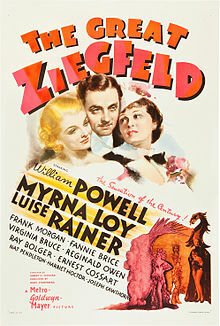 ^ "THE GREAT ZIEGFELD (U)". British Board of Film Classification. May 7, 1936. Diarsipkan dari versi asli tanggal November 5, 2014. Diakses tanggal November 4, 2014. Bleiler, David (October 1, 2004). TLA Video & DVD Guide 2005: The Discerning Film Lover's Guide. St. Martin's Press. ISBN 978-0-312-31690-7. Boyle, Sheila Tully; Bunie, Andrew (October 1, 2005). Paul Robeson: The Years of Promise and Achievement. Univ of Massachusetts Press. ISBN 978-1-55849-505-0. Bryant, Roger (2006). William Powell: The Life and Films. McFarland. ISBN 978-0-7864-5493-8. Cornelius, Marcus M. (July 11, 2008). Out of Nowhere: The Musical Life of Warne Marsh. iUniverse. ISBN 978-1-4759-2161-8. Dunne, Michael (2016-03-24). American Film Musical Themes and Forms. McFarland. ISBN 978-0-7864-8337-2. Green, Stanley (1999). Hollywood Musicals Year by Year. Hal Leonard Corporation. ISBN 978-0-634-00765-1. Griffin, Mark (March 9, 2010). A Hundred Or More Hidden Things: The Life and Films of Vincente Minnelli. Da Capo Press. ISBN 978-0-306-81893-6. Gutner, Howard (2001). Gowns by Adrian: the MGM years, 1928–1941. Harry N. Abrams. Halle, David; Beveridge, Andrew A. (April 9, 2013). New York and Los Angeles: The Uncertain Future. Oxford University Press. ISBN 978-0-19-933969-3. Hanson, Nils (2011). Lillian Lorraine: The Life and Times of a Ziegfeld Diva. McFarland. ISBN 978-0-7864-6407-4. Hayter-Menzies, Grant (January 1, 2009). Mrs. Ziegfeld: The Public and Private Lives of Billie Burke. McFarland. ISBN 978-0-7864-5308-5. Heritage Capital Corporation (October 1, 2004). Grey Smith, Brad Breitbarth & Jim Halperin, ed. Heritage Galleries and Auctioneers Vintage Movie Poster Auction #607. Ivy Press. hlm. 2–. ISBN 978-1-932899-35-1. Hischak, Thomas S. (June 2, 2008). The Oxford Companion to the American Musical: Theatre, Film, and Television. Oxford University Press. ISBN 978-0-19-533533-0. Jones, John Bush (2003). Our Musicals, Ourselves: A Social History of the American Musical Theatre. UPNE. ISBN 978-0-87451-904-4. Leider, Emily W. (September 3, 2011). Myrna Loy: The Only Good Girl in Hollywood. University of California Press. ISBN 978-0-520-94963-8. Marling, Karal Ann (June 30, 2009). Merry Christmas! Celebrating America's Greatest Holiday. Harvard University Press. ISBN 978-0-674-04062-5. Merwe, Ann Ommen van der (March 26, 2009). The Ziegfeld Follies: A History in Song. Scarecrow Press. ISBN 978-0-8108-6716-1. Mizejewski, Linda (1999). Ziegfeld Girl: Image and Icon in Culture and Cinema. Duke University Press. ISBN 978-0-8223-2323-5. Parish, James Robert; Mank, Gregory W.; Picchiarini, Richard (January 1, 1981). The Best of MGM: The Golden Years (1928-59). Arlington House. Parish, James Robert; Pitts, Michael R. (1992). The Great Hollywood Musical Pictures. Scarecrow Press. ISBN 978-0-8108-2529-1. Ramírez, Juan Antonio (January 1, 2004). Architecture for the Screen: A Critical Study of Set Design in Hollywood's Golden Age. McFarland. ISBN 978-0-7864-1781-0. Smyth, J.E. (October 27, 2006). Reconstructing American Historical Cinema: From Cimarron to Citizen Kane. University Press of Kentucky. ISBN 978-0-8131-3728-5. Solomon, Matthew (2011). Fantastic Voyages of the Cinematic Imagination: Georges Méliès's Trip to the Moon. SUNY Press. ISBN 978-1-4384-3582-4. Vogel, Michelle (2007-02-20). Olive Thomas: The Life and Death of a Silent Film Beauty. McFarland. ISBN 978-0-7864-5526-3. AlZayer, Penni (2010). Middle Eastern Dance. Infobase Publishing. ISBN 978-1-60413-482-7. Wikimedia Commons memiliki media mengenai The Great Ziegfeld. Halaman ini terakhir diubah pada 3 Oktober 2018, pukul 04.35.